This document aims to provide an introduction into lower-limb amputees and low back pain including; epidemiology, etiology, biomechanics, gait (compensation strategies), types of amputation and associated yellow flags. Low back pain is a common complaint amongst the general population and is considered the leading cause of disability. Amongst the adult general population low back pain has a point prevalence of approximately 12%, with a one-month prevalence of 23%, a one-year prevalence of 38%, and a lifetime prevalence of approximately 40%. However, the prevalence of low back pain amongst lower-limb amputees is thought to be higher than that of the general population. Back pain has been reported to affect 52% to 89.6% of lower-limb amputees. Several studies involving lower-limb amputees have identified that low back pain is often considered more bothersome than phantom or stump pain. In a retrospective cross-sectional survey of people with lower limb amputations (n=255) 52% rated their back pain as “persistent and bothersome” whilst 25% described it as frequent, of severe intensity, causing interference with daily activities such as social, recreational, family and work activities. Subsequently, it has been acknowledged that low back pain in this population significantly affects well-being and physical and psychological health. Amongst the literature, it has been hypothesised that low back pain in persons with lower limb amputation is commonly attributed to somatisation or inappropriately made prostheses, inadequately formed stump and biomechanical factors such as movement and muscle asymmetries. It is thought that such asymmetries and movement impairments may result in abnormal tissue loading and deformation of musculoskeletal structures leading to low back pain and disability amongst this population. Amongst recent literature an association between psychological factors and measures of patient function and pain severity has been identified in persons with disabilities . Depression and anxiety are prevalent following lower limb amputation . Individuals are faced with many psychological threats and challenges such as physical dysfunction, alterations in self-concept, pain and changes in their lifestyle . In addition to physical rehabilitation completed, environmental and social factors are also paramount . Catastrophizing ‘the tendency to focus on pain and negatively evaluate one’s ability to deal with it’ has consistently been found to be the greatest psychological factor associated with dysfunction and pain . In addition, several studies findings highlight the significance of the social environment for amputees within the first few months after discharge. It has been hypothesized that social factors prospectively predict the development of pain and physical functioning. Furthermore, patients that are discharged with social support however lacks solicitous environments are less likely to develop pain, reporting reduced levels of physical dysfunction. It is therefore key that individual's values and needs are understood and treated accordingly. Lower limb amputation results in a loss of somato-sensensation and motor control. A persons walking depends on the integration of afferent sensory stimulation and efferent motor control for movement. In order to perform daily activities amputees compensate for the loss in sensorimotor function with compensations from the intact and residual limb. Asymmetrical compensatory strategies have been considered a ‘normal’ adaption following amputation; however, it has been proposed that some of these asymmetries may be ‘mal-adaptive’ causing secondary musculoskeletal dysfunctions. There is an evolving area of research suggesting that LBP has a chronic impact on function for lower limb amputees. There is currently no definitive cause for LBP in amputees but movement asymmetries and muscular asymmetries are hypothesised to contribute to LBP. This model provides a framework which highlights the potential causes for LBP in people with lower limb amputation. Amputees find ambulation much more difficult than non amputees because they depend on prosthesis for body weight support and gait mobility. Therefore, the biomechanics of an amputees gait are altered causing asymmetries. These asymmetries can alter the distribution of load which can lead to the development of back pain. Various methods have been used to determine the symmetry between limbs and energy expenditure, stance and gait speed are widely accepted means of measuring gait symmetry. It is well known and accepted that energy expenditure is higher in lower limb amputees than non amputees (NA). The mechanical efficiency of gait is thought to decrease in lower limb amputees due to abnormal movement patterns associated with their gait. These abnormal patterns are the result of compensatory strategies employed to adapt to the functional loss of one or more limbs. The loss of a limb results in absent joints, active and passive structures and differences in lever length. Therefore, the compensatory strategies employed to counter this loss include greater movements of the centre of mass and compensations of the remaining intact joints, ligaments and musculature. Consequently, their gait is altered and it results in lower limb amputees expending more energy than NA during gait. It is generally thought above knee amputees (AKA) expend more energy than below knee amputees (BKA) because BKA have an intact knee mechanism, more intact musculature and with this a longer lever which are all thought to provide better function during gait which requires expending less energy than AKA . Below knee amputees exhibit increased energy expenditure over NA due to the absent ankle plantar flexors. Therefore, the remaining joints and limb musculature must compensate increasing energy expenditure. The literature is generally in agreement that AKA expend more energy than BKA. A study of 89 lower limb amputees (22 AKA, 61 BKA and 6 syme) concluded the higher the amputation the more energy expended during gait (P<0.001). Waters, Perry, Antonelli et al. agreed with this and concluded AKA expend more energy than BKA. However, in this study they also reported traumatic BKA had a higher rate of oxygen uptake than both vascular and traumatic AKA, possibly due to the increased gait velocity of BKA. However, Goktepe, Cakir, Yilmaz et al. reported AKA expend more energy than BKA but the difference was not significant (P=0.35-0.75) when measuring lower limb amputees energy expenditure at different walking speeds on flat and inclined surfaces. The increased effort required during gait due to compensatory strategies employed by lower limb amputees is a possible contributing factor to the development of low back pain in LLA (Figure 3). The stance phase of amputees is thought to be asymmetrical between the intact and prosthetic limb due to the altered kinematics and kinetics occurring. A systematic review of 89 papers revealed those with BKA and AKA had an increased stance phase on the non amputated leg compared to the amputated leg. As a result of the increased stance phase, increased loads go through the intact joint and this repetitive stress may result in increased pain and joint degeneration experienced in lower limb amputees and with that, the development of low back pain . Lower gait speeds are reported to be linked with gait asymmetries and this is linked to the incidence of low back pain . Gait in amputees is generally slower than non amputees due to the altered kinematics occurring in response to the loss of one or more limb. Consequently, the function of a lower limb amputee is not as efficient compared to a non amputee and the amputee must adapt thus reducing gait velocity . Vllasolli et al., as well as measuring energy efficiency, investigated gait velocity in lower limb amputees. They concluded AKA have significantly slower gait speeds compared to BKA walking at a comfortable speed (P=<0.001). Waters et al. 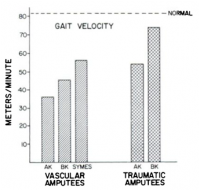 also concluded the higher the level of amputation the slower the gait velocity. It could be hypothesised that amputees modify their gait speed to keep their energy expenditure within normal limits, something Waters et al. found. This could be a protective mechanism employed by amputees so they can sustain prolonged periods of exercise without becoming exhausted. Beyaert et al. on a study of 15 non amputee and 17 amputee participants concluded BKA and NA have comparable walking speed and cadence. This is possibly due to the increasing technology of the prosthetics which allow for a more normal gait pattern. Faster walking speeds have been shown to increase the load on the intact limb and lead to significant asymmetry. Therefore, this has the possibility to lead to the development of low back pain. To summarise, abnormalities in speed and stance are indicative of compensatory strategies which are thought to cause or at least contribute to the development of low back pain . Figure 3 explains the reasoning for this. According to Morgenroth et al., (2010), above knee amputees (AKA) with LBP (n=9) have increased transverse plane motion compared with AKA reporting no LBP (n=8). In addition, during gait lumbar extension increased in participants with AKA (n=17) compared to a controlled group with no disabilities (n=6) . This finding however is believed to possibly be affected as a result of the control group individuals mean age (32.3) lower than the experimental group (47.5). Rabuffetti et al. (2005) observed gait in AKA (n=14) compared with the opposite leg and noted limited hip extension during heel-strike of the prosthetic limb. The authors suggested the findings were as a result of the ischial-weight bearing socket in the majority of individuals included in the study, increasing their anterior pelvic tilt throughout the stance phase. Dynamic asymmetries within the lumbopelvic region may be of significance as evidence suggests the findings observed may be a likely predisposing factor to LBP in post-amputees . It has been observed that the majority of above knee amputees side flex their trunk towards the amputated side during the stance phase of the prosthetic leg in the frontal plane. This movement asymmetry is thought to be associated with weak hip stabilising muscles (hip flexors and abductors) on the amputated side. Whilst this theory remains to be tested, according to a study by Jaegers et al., up to 30% of the hip stabilising muscles may be atrophied in comparison with the intact side in persons with above knee amputations. The amount of atrophy is thought to be closely associated with sump length. Goujon-Pillet et al. also investigated trunk and pelvic movement in persons with above knee amputation (n=27). Results of this study concluded that there was a greater pelvic range of motion (p=0.05) in both the frontal and sagittal planes in persons with above knee amputations when compared to the non-disabled control group (n=33). Results of this study also observed a decrease in counter rotation between the pelvis and trunk in the transverse plane in persons with above knee amputations. This may be of significance as evidence suggests that patients with low back pain also lack the ability to counter rotate the pelvis and trunk. Compensatory strategies in response to the loss of a limb occur at the knee joint of amputees and this alters the kinetics and kinematics. The knee joint is important for providing stability and propulsion during the gait cycle and to prevent wear and tear of the weight bearing joints it also has a “shock absorbing” affect. A study of 17 unilateral, BKA concluded the intact limb undergoes a significant increase in knee flexion (between 5-9°) during the loading response compared to the prosthetic limb and to the knee flexion angles of NA . Knee flexion parameters during the loading phase on the prosthetic limb is reduced by 3-9˚ compared to the intact limb in NA. AKA often have absent or negative knee flexion on the prosthetic limb during this phase due to an absent knee joint. The reduced knee flexion on the prosthetic limb is possibly to prevent the knee from giving way due to reduced strength in the knee extensors and the absence of the plantarflexors . Furthermore, the intact knee joint undertakes significantly more work during gait than the prosthetic limb as well as significantly more loads compared to the intact limbs of NA and the prosthetic limb of amputees. This could be a protective mechanism to protect the stump, as it is not a natural weight bearing joint, or because of muscle weakness, decreased confidence and/or balance of the amputated leg. Compensatory mechanisms employed in response to the loss of a limb alter joint kinetic and kinematics at the ankle . This is thought to affect the stance, toe off and early swing phases of the gait cycle . The ankle plantar flexors are the predominant muscles active during the toe off phase of gait and are responsible for 80% of the force produced during this phase of the gait cycle. Consequently, this toe off force decreases in lower limb amputees and the prosthetic limb does around 20% of total work done by NA ankles. This significantly reduces the mechanical work generated by the lower extremity during gait. Due to absence of the plantar flexors, less ankle range of motion has been documented in the prosthetic limb of lower limb amputees compared to the ankle of an intact limb during stance phase of gait. A study of 18 participants reported an increased range of motion during gait in the intact limb (26˚) of amputees compared to NA (21˚). However, this difference was not significant. The increased range of motion present in the intact limb of amputees is to allow them to clear the prosthetic limb during the swing phase of gait due to the limited ankle range in the prosthetic limb. A study of 24 participants concluded the absence of the plantar flexors affects the ankle kinematics causing compensations. Compensations include the intact limb undergoing a third more work than the prosthetic limb at the ankle joint due to the decreased push off of the prosthetic limb. Therefore, the altered kinematics and kinetics in the ankle joint could be a cause of the development of low back pain. Unilateral below the knee amputees reportedly walk with a smooth, unbroken gait pattern that is not easily distinguishable from that of non amputees. However, asymmetries in their gait occur due to compensatory strategies employed in response to the loss of one or more limbs. 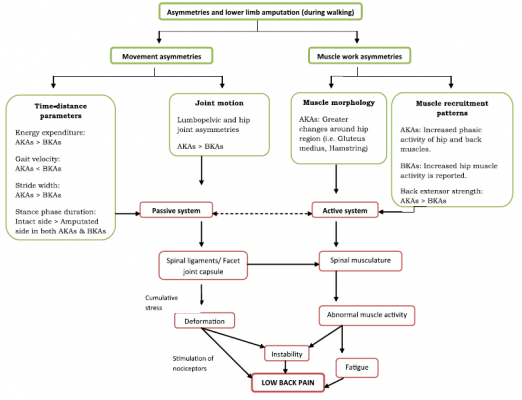 Therefore, these subtle compensatory changes that occur may bring on the development of low back pain in AKA and BKA (Figure 2). Morphological changes are thought to occur in amputees due to a combination of bed rest, changes to gait compensations and inability to fully contact the distal muscles of the residual limb . The composition and circumference of soft tissue around the residual limb could influence the control of prosthesis through the socket fit, comfort and ability to fully weight-bare in the prosthesis. Following AKA, hip muscles of the amputated side can atrophy up to 30%. 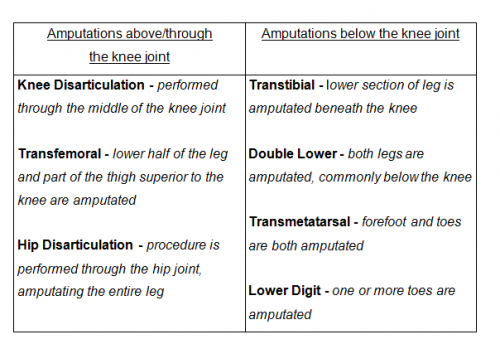 There is a positive relationship between proximal level of amputation and degree of atrophy . In 5 AKA participants, dual-energy x-ray absorptiometry identified significant muscle atrophy in residual limb (P<0.001) compared to contralateral limb this also corresponded with significant increase in percentage of fat (P<0.05). The relative limb difference of muscle cross sectional area was 117.6%±22.2% compared to the in-tact thigh. There are significant changes in muscle and fat composition between in-tact and amputate limbs. An average of 39% difference between-limbs in fat cross-sectional area (P<0.05) and the relative difference of muscle cross sectional area between limbs was significantly less in the residual limb 104.4%±32.6% (P<0.01). Similar findings identified 17 amputees wearing patella bearing prosthetic had significant atrophy of the thigh on the amputated side (P<0.001) when compared to the contralateral limb Participants underwent muscle ultrasonography and the rectus femoris, vastus lateralis, vastis medius and vastus intermedius had significant atrophy (P<0.001) but the sartorius, gracilis and semitendinosus did not. The general cross-sectional area of the thigh had reduced from ranges 69.6%–96.7%). It has been recognised in two studies that muscle atrophy in the rectus femoris of the in-tact side can occur. We could hypothesise that the amputee patients may have spent a large amount of time in a wheelchair or off their feet in the initial stages of rehabilitation leading to atrophy occurring. Figure 7. Percentage of muscle thickness and cross-sectional areas on the amputated thigh compared to the contralateral muscles (ND Not determined, NS Not significant). AKA have significantly increased back extensor strength compared to BKA (P<0.05). This may be a compensation strategy for the lack of hamstrings and quadriceps by using their back extensors during walking. An increase in back extensor strength causes changes to neutral posture and spinal stability. In contrast, AKA have significantly reduced endurance of the back extensors compared to BKA (P<0.05). Reduced endurance may cause LBP in two ways. Firstly, when muscles fatigue additional pressure is placed on supporting structures of the spine leading to LPB. Secondly, a shorter stride length with prosthetic leg places less demands on the back extensor muscles therefore activation is reduced and instability can occur . Only one study study has explored back extensor strength and LBP. This study lacks inter-rater reliability of the manual muscle strength testing and has a low statistical power (<60%). Due to a lack in research this is no comparable studies for trunk strength and LBP in lower limb amputees. Figure 8. Independant t-tests for all variables grouped by amputation level. A systematic review of 13 articles identified major asymmetries performed in the amputated and in-tact legs during walking . Both legs had increased work of the hip extensors during early stance compared to control subjects. This increase in gluteus maximus activation during walking is thought to transfer energy into the trunk to facilitate forward progression. One of the studies which support this finding identified a 270% increase in work of hip extensors during initial stance of the intact limb. Both studies suggest this increase in hip extension during initial stance is thought to facilitate push off from the prosthetic limb. The prosthetic ankle only achieves 20% of the work done by a control ankle due to its reduced mobility and lack of plantarflexion. Therefore this increase in hip extensor activity is a compensatory mechanism providing major source of energy for forward propulsion . Similar findings in a non-randomized control study identified increased hip activity by the intact-limb. Eight participants were compared against eight controls using a gait analysis system. The concentric hip extension of the in-tact limb in stance was greater than that of normal subjects and the amputee subjects (9.9+/- 5.5J vs 3.6 +/- 2.6 J). The intact-limb also exhibits a significant increase in hip flexor activity during push-off phase (p<0.05). This is considered to encourage weight transference on to prosthetic limb. Most of the asymmetries highlighted in the systematic review can be attributed towards reduced weight acceptance on to the prosthetic leg and the loss of ankle plantarflexors. Amputees have significantly reduced strength of quadriceps and hamstrings of the affected limb (P<0.01). Isakov et al (1996) measured strength in 18 amputees using a dynamometer and observed a range of 35-60% difference in strength compared to the intact side. This suggests that the in-tact leg takes a greater work load to overcome this loss in strength and facilitate walking. These findings correspond with multiple authors who identified that ground reaction force of in-tact limp during walking is greater than the prosthetic leg. The increase in ground reaction force suggests the strength discrepancy between limbs causes amputees to rely heavily on their intact limb causing asymmetrical limb loading. The amputee relies upon quadriceps and hamstrings for forward propulsion due to the absence of plantar-flexor muscles on the prosthetic side. Therefore, reduced quadriceps and hamstring strength over the amputated knee will impair the ability of the residual limb to produce enough propulsion for walking. This significant strength asymmetry between knee muscles corresponds to asymmetrical movement identified by digital gait analysis. Digital gait analysis identified 66% more asymmetries in the amputee group than control (P>0.05) and these findings identified correlations between strength and gait asymmetry. One explanation for reduced strength in residual limb hamstrings and quadriceps is that forces on the residual limb created by walking create increased blisters, sore and discomfort on the limb which can lead to gait asymmetries, for example; extending the hip and knee reduces pressure in the socket which may lead to decreased demand on the muscles and reduced strength. The prescription of a prosthetic limb corresponds to the patient’s needs and functional level. Prosthetic components have a large variance in costs therefore practitioners are require to create objective criteria for prosthetic prescription. Blachfords Prosthetics and Orthotics is a worldwide leading prosthetics company which supply over 35% of the prosthetics in the NHS. The components they prescribe are based upon a graded impact and activity guide. It has been identified that different prosthetic components influence gait symmetry. Participants reported they felt more confident in a certain prosthetic foot which reduced their compensation strategies. Although it may be assumed a more mobile component would create symmetry of the intact leg, it does not necessarily create a symmetrical gait. If a person does not have the energy and control to stabilise a mobile component they are likely to fatigue early causing asymmetrical movements and potentially lead to musculoskeletal disorders. Appropriate fitting of a socket improves control over the prosthesis, potentially improving proprioception and force transfer in to the residual limb. This highlights the importance of MDT working to obtain maximal fit of the socket throughout their rehabilitation and amputee life. Integrated within this is the importance of teaching the amputee how to donn and doff the socket independently for maximal control over the prosthesis. There are limitations and benefits to different types of prosthetic components, for example; A trans- femoral ischium socket restricts natural hip extension and can cause compensatory mechanisms at the pelvis. A less mobile prosthetic ankle has substantial reduction in dorsiflexion potentially leading compensatory mechanism such as, hip hiking to facilitate floor clearance and over-activity in the in-tact hip . ↑ 1.0 1.1 Kulkarni J, Gaine WJ, Buckley JG, Rankine JJ, Adams J. Chronic low back pain in traumatic lower limb amputees. Clinical Rehabilitation 2005;19:81–86. http://dx.doi.org/10.1191/0269215505cr819oa (accessed 5th December 2015). ↑ Hayden J, Van Tulder MW, Malmivaara A, Koes BW. Exercise therapy for treatment of non-specific low back pain. The Cochrane Database of Systematic Reviews 2005;3. http://dx.doi.org/10.1002/14651858.CD000335.pub2. [accessed: 27th December 2014]. ↑ 3.0 3.1 Manchikanti L, Singh V, Falco FJE, Benyamin RM, Hirsch, JA. Epidemiology of Low Back Pain in Adults. Neuromodulation: Technology at the Neural Interface 2014;17:3–10. http://dx.doi.org/10.1111/ner.12018 [accessed 5th January 2015]. ↑ 4.0 4.1 4.2 Kusljugić A, Kapidzić-Duraković S, Kudumović Z, Cickusić A. Chronic low back pain in individuals with lower-limb amputation. Bosnian Journal of Basic Medical Sciences 2006;6:67–70. ↑ 5.0 5.1 5.2 Smith DG, Ehde DM, Legro MW, Reiber GE, Del Aguila, M, Boone DA. Phantom limb, residual limb, and back pain after lower extremity amputations. Clinical Orthopaedics and Related Research 1999;361:29–38. ↑ 6.0 6.1 Abdul-Sattar A. Amputation-related back pain: Prevalence, Associated Risk Factors and Correlation with Functional Disability. Egypt Rheumatology Rehabilitation 2007;34:183–195. http://applications.emro.who.int/imemrf/egypt_rheum_regabil_2007_34_1-2_183.pdf (accessed 20th December 2014). ↑ 7.0 7.1 Ehde DM, Smith DG, Czerniecki JM, Campbell KM, Malchow DM, Robinson LR. Back pain as a secondary disability in persons with lower limb amputations. Archives of Physical Medicine and Rehabilitation 2001;82:731–734. http://dx.doi.org/10.1053/apmr.2001.21962 (accessed 28th December 2014). ↑ 8.0 8.1 8.2 8.3 8.4 8.5 Friel K, Domholt E, Smith DG. Physical and functional measures related to low back pain in individuals with lower-limb amputation: An exploratory pilot study. Journal of Rehabilitation Research and Development 2005; 42: 155-166. ↑ Morgenroth DC, Orendurff MS, Shakir A, Segal A, Shofer J, Czerniecki JM. The relationship between lumbar spine kinematics during gait and low-back pain in transfemoral amputees. American Journal of Physical Medicine & Rehabilitation 2010;89:635–643. http://dx.doi.org/ 10.1097/PHM.0b013e3181e71d90. (accessed 5th January 2015). ↑ 10.00 10.01 10.02 10.03 10.04 10.05 10.06 10.07 10.08 10.09 10.10 10.11 10.12 10.13 10.14 10.15 Devan H, Hendrick P, Cury Ribeiro D, Hale L, Carman A. Asymmetrical Movements of the Lumbopelvic Region: Is this a Potential Mechanism for Low Back Pain in People with Lower Limb Amputation? Disability and Rehabilitation. 2014; 82: pp.77-85. ↑ Jensen MP, Turner JA, Romano JM, Karoly P. Coping with chronic pain: a critical review of the literature. 1991; 47: 249-83. ↑ Boothby JL, Thorn BE, Stroud MW, Jensen MP. Coping withfckLRpain. Psychosocial factors in pain. 1999; : 343-359. ↑ 23.0 23.1 23.2 Kaufman K, Firttoli S, Frigo C. Gait Asymmetry of Transfemoral Amputees Using Mechanical and Microprocessor-Controlled Prosthetic Knees. Clinical Biomechanics 2012; 5: 460-465. ↑ Ephraim P, Wegener S, Mackenzie E, Dillingham T, Pezzin L. Phantom pain, residual limb pain, and back pain in amputees: Results of a national survey. Archives of Physical Medicine and Rehabilitation 2005; 10: 1910–1919. ↑ 25.0 25.1 25.2 25.3 25.4 25.5 25.6 Vllasolli T, Zafirova B, Oravcanec N, Poposka A, Murtezani A, Krasniki B. Energy Expenditure and Walking Speed in Lower Limb Amputees: a Cross Sectional study. Ortopedia, Traumatologia, rehabilitacja 2014; 6: 419-426. ↑ 26.0 26.1 26.2 26.3 Bell J, Wolf E, Schnall B, Tis J, Potter B. Transfemoral Amputations: Is There an Effect of Residual Limb Length and Orientation on Energy Expenditure?. Clinical Orthopeadics and Related Research 2014; 10: 3055-3061. ↑ 28.0 28.1 28.2 28.3 28.4 28.5 Waters R, Perry J, Antonelli D, Hislop H. Energy cost of walking of amputees: the influence of level of amputation. The Journal of Bone and Joint Surgery 1976; 58: 42-46. ↑ Goktepe A, Cakir B, Yilmax B, Yazicioglu K. Energy expenditure of walking with prostheses: Comparison of three amputation levels. Prosthetics and Orthotics International 2010; 1: 31-36. ↑ Gailey R, Allen K, Castles J, Kucharick J, Roeder M. Review of secondary physical conditions associated with lower-limb amputation and long-term prosthesis use. Journal of Rehabilitation Research & Development 2008; 1: 15-30. ↑ 32.0 32.1 Nolan L, Wit A, Dudzinski K, Lees A, Lake M, Wychowanski M. Adjustments in gait symmetry with walking speed in trans-femoral and trans-tibial amputees. Gait & Posture 2003; 2: 142-151. ↑ Grumillier C, Martinet N, Paysant J, Andre J, Beyaert C. Compensatory mechanism involving the hip joint of the intact limb during gait in unilateral trans-tibial amputees. Journal of Biomechanics 2008; 14: 2926-2931. ↑ 35.0 35.1 Tura A, Raggi M, Rocchi L, Cutti A, Chiari L. Gait symmetry and regularity in transfemoral amputees assessed by trunk accelerations. Journal of Neuroengineering and Rehabilitation 2010; 4: 1-10. ↑ 40.0 40.1 Goujon-Pillet H, Sapin E, Fodé P, Lavaste F. Three-dimensional motions of trunk and pelvis during transfemoral amputee gait. Archives of Physical Medicine and Rehabilitation 2008;89:87–94. http://dx.doi.org/10.1016/j.apmr.2007.08.136 (accessed 7th January 2015). ↑ Arendt-Nielsen L, Graven-Nielsen T, Svarrer H, Svensson P. The influence of low back pain on muscle activity and coordination during gait: a clinical and experimental study. Pain 1996;64:231-240. ↑ Selles RW, Wagenaar RC, Smit TH, Wuisman PI. Disorders in trunk rotation during walking in patients with low back pain: a dynamical systems approach. Clinical Biomechanics 2001;16:175–181. http://dx.doi.org/ http://dx.doi.org/10.1016/S0268-0033(00)00080-2 (accessed 7th January 2015). ↑ Sanderson D, Martin, P. Lower extremity kinematic and kinetic adaptions in unilateral below-knee amputees during walking. 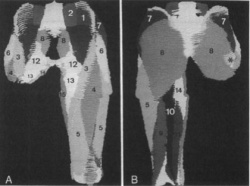 Gait and Posture 1997; 2: 126-136. ↑ 44.0 44.1 44.2 44.3 44.4 44.5 44.6 44.7 44.8 Seroussi R, Gitter A, Czerniecki J. Weaver K. Mechanical Work Adaptions of Above-Knee Amputee Ambulation. Archives of Physical Medicine and Rehabilitation 1996; 77: 1209-14. ↑ 46.0 46.1 46.2 46.3 Schmalz T, Blumentritt S, Reimers CD. Selective thigh muscle atrophy in trans-tibial amputees: an ultrasonographic study. Arch Orthop Trauma Surg 2001; 121: 307-212. http://link.springer.com/article/10.1007/s004020000227 (Assessed 5 Jan 2014). ↑ 47.0 47.1 Isakov E, Burger H, Gregoric M, Marincek C. Isokinetic and Isometric Strength of the Thigh Muscles in Below-Knee Amputees. Clinical Biomechanics 1996; 11: 233-235. http://www.sciencedirect.com/science/article/pii/026800339500078X (Accessed 21 Dec 2014). ↑ Sadeghi H, Allard P, Duhaime P. Muscle Power Compensatory Mechanisms in Below-Knee Amputee Gait. American Journal of Physical Medicine 2001; 80: 25-32. ↑ Rabuffetti M, Recalcati M, Ferrarin M. Trans femoral Amputee Gait: Socket – Pelvic Constraints and Compensation Strategies. Prosthetics and Orthotics International 2005; 29: 183-192.